After city founder Harry Culver announced his plans in 1913 at the California Club in Los Angeles, he filed Main Street with the County of Los Angeles. His initial purchase of land extended all the way north to Pico Boulevard, although no property above Venice Boulevard is in Culver City today, and in fact the top of Main Street, from the alley, is actually Bagley Avenue in Los Angeles. Harry Culver’s offices were located on this street, which was the hub of activity. It was at the foot of Main Street that Harry Culver built his Hotel Hunt, which opened in 1924. This six-story landmark, now the Culver Hotel, began its rebirth under Catlett Construction/Historic Hollywood Properties. The “Little People” were housed on Main Street, in the Culver Hotel when The Wizard of Oz began filming in 1938, with the overflow accommodated across the street at the Adams Hotel. Main Street’s redevelopment began in 1991, through a “Charette” process that involved the community. 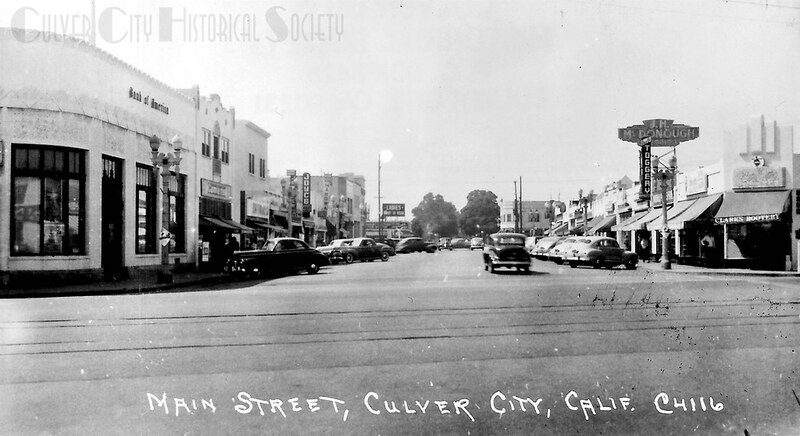 Click here to get occasional email announcements about the Culver City Historical Society and our events. Located in the Veterans Memorial Building at 4117 Overland Avenue, the Culver City Historical Society Archives & Resource Center (ARC) is open the 1st and 3rd Sundays of every month from 1:00p to 3:00p and by appointment. Please enter through the parking lot at the rear of the building.